Win in Romandie, win the Tour? That's been the case in 2011, 2012 and 2013 anyway. Cyclingstage.com brings you the recent winners form the Swiss race. The Giro d’Italia began in 1909 in a bid to increase sales for La Gazzetta dello Sport. Italian riders dominated the early decades of the race but that changed from the 60's onwards with foreigners seizing control. Recent years have seen a mix, with plenty of Italian victories to keep the tifosi happy. Cyclingstage.com presents the recent winners and record holders from Italy's grand tour. The Critérium du Dauphiné (formerly the Dauphiné Libéré) is an eight-day stage race. It takes place in the French Dauphiné region in early June. The road book contains several mountain stages - very often visiting climbs like the Mont Ventoux -, making it the perfect preparation for the Tour de France which follows soon after. Expect the riders on the Dauphine podium to have a big impact at the Tour. Cyclingstage.com presents the recent winners and record holders. The Tour de France is the holy grail of cycling. 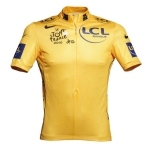 Winning a stage or even wearing the yellow jersey for a day can make a career. Wearing a jersey into Paris can make a life. Cyclingstage.com presents La Grande Boucle's recent winners and record holders.